Astronomers see exoplanet orbiting its parent star! This is extremely cool news: astronomers have, for the first time, directly seen an exoplanet orbiting its star from one side to the other! The star in question is Beta Pictoris (or just Beta Pic to its friends), a very young star — it’s only a few million years old, compared to the Sun’s advanced age of 4.56 billion — with about twice the Sun’s mass and 9 times its brightness. As stars go, Beta Pix is pretty close, just 63 light years away, and is easily bright enough to be seen with the unaided eye from the southern hemisphere. In the above picture, taken using one of the European Southern Observatory’s ginormous 8.2 meter units of the Very Large Telescope, Beta Pic is represented by the dot in the center. The star is so bright its light swamps everything around it, so the star itself has been blocked by a piece of metal inside the camera that took the shot (that’s the reason for the dark circle in the center of the picture) so the astronomers subtracted the image of a nearby star to minimize the effects of the light from Beta Pic itself; this is a common technique I’ve used myself in Hubble images*. This allows us to see much fainter stuff near the star. This picture is actually a composite of three separate observations. The outer part with the blue fuzzy stuff was observed in 1996, and I’ll get back to that in a sec. The good stuff is in the center: two images of the planet, called Beta Pic b, are superposed in the picture; it was observed in 2003 (left blob), then again in late 2009 (right blob). Observations taken just months before in 2008 and 2009 observation didn’t show the blob at all — it must have been too close to the star to be seen clearly — indicating this really is a planet orbiting the star, and not just some background object like a star or galaxy. In other words, astronomers have captured the motion of the planet as it physically moved from one side of the star to the other! Very cool. Using these observations, the orbit of the planet has been roughly estimated and is shown in the picture as well, though the tilt of it has been exaggerated for clarity. In reality, we see the orbit almost exactly edge-on. But we can see right away the orbit is not circular! The planet is clearly farther from the star on the left than on the right, meaning its orbit is pretty elliptical. In fact, it varies in distance from one billion to 2 billion kilometers from Beta Pic — roughly the distance of the Sun to Saturn and Uranus, respectively. That’s a huge variation. If this planet were in our solar system, there would be chaos as its gravity disturbed the orbits of all the outer planets. Now, back to the weird wing-like things sticking out of either side. Those are from a 1996 observation, and what you’re seeing there is the actual disk of dust and junk from which that planet (and star) formed. Back in the 1980s, it was first determined that Beta Pic was blasting out a lot more infrared light than would be expected for its type of star. Astronomers took a better look, and found that bright disk you see in the picture. We see the disk almost exactly edge-on, so it looks like a thick, fuzzy line. Over the years, more observations showed more detail. See how the disk is warped, bent, twisting up on the left side and down on the right? The false-colored rainbow-hued image here shows observations of the disk using my old camera STIS (bottom; on top is an earlier WFPC2 image) on board Hubble, and the bumps and wiggles in the inner disk are easy to see. That sort of thing can happen if a planet in the disk is tugging on the material as it orbits the star. Lots of other observations tantalizingly hinted at a planet buried in that mess, but unfortunately technology wasn’t up to the task of teasing out a faint planet from the bright star and disk. And that’s why this is such a personal story for me. When I was a kid, there were 9 planets, and that was it. In 1992 the first planets were detected around other stars, and in 1995 the first planets were detected around sun-like stars. But the disk around Beta Pic was first seen in the 1980s, when I was just starting out in college as a young astronomy major. 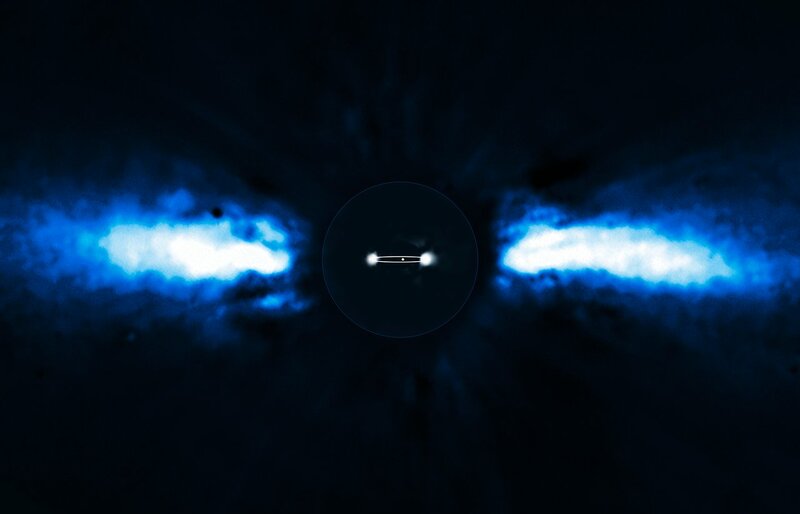 It’s important to note that Beta Pic was the very first star to be seen surrounded by such a disk, basically confirming for the first time that stars formed from disks of material. Seeing the early pictures were fascinating, but maddening: they hinted at a planet being there, but we just didn’t have the tech to see it! Finding a planet orbiting another star was one of the most fundamentally important and exciting goals of astronomy at the time. Every time a new image came out, we were just barely squeaking closer to that goal. I would read every new journal paper, every new popular level article that came out, and every time the conclusion was the same: we’re just a few more years away from finding other planets. Arrrg! It was like an itch that couldn’t be scratched, except this itch was a combination of poison ivy, poison oak, and a thousand mosquito bites. Maddening! Over the years I was tangentially involved with Beta Pic; I didn’t directly work on the rainbow STIS image of it above, but my boss Don Lindler did. I remember sitting around the office with Don and Sally Heap (the woman who made that STIS observation), talking about those images, trying to figure out how best to squeeze information and detail out of them. I also worked extensively with other astronomers who had observations of stars surrounded by disks. Of all the work I did on Hubble, those were my favorite observations, and the ones I most enjoyed working on. I got to know them really well, like friends: AB Aurigae (pictured above), HD 163296, HD 100546, and others. These all had spectacular and beautiful disks of material swirling around them, all had the ingredients necessary to make planets. But no planets were to be seen. That’s all changed now. We’ve seen and confirmed a planet around the grand-daddy of all these stars, Beta Pic. And, as we had hoped, the newly-discovered planet has the right location and the right mass to explain the warping of the disk. Astronomers were right all along! And now, finally, after all those years, we’ve finally been able to scratch that itch. Ahhhhhhhhhhhhh. Beta Pic Image credits: ESO/A.-M. Lagrange; L. Calçada. Hubble image credits: Al Schultz (CSC/STScI, and NASA), Sally Heap (GSFC/NASA); C.A. Grady (National Optical Astronomy Observatories, NASA Goddard Space Flight Center), B. Woodgate (NASA Goddard Space Flight Center), F. Bruhweiler and A. Boggess (Catholic University of America), P. Plait (hey!) and D. Lindler (ACC, Inc., Goddard Space Flight Center), M. Clampin (Space Telescope Science Institute), and NASA. * My thanks to astronomer Sarah Kendrew for correcting me on this! – Huge exoplanet news: pictures! – Planet imaged around a sunlike star? !